Tag-team matches are a staple of professional wrestling. Sadly, their divisional significance is a far cry from its glory days in the 80’s and 90’s. Often times, these matches steal the show and the prestige of being the tag team champions is the ultimate motivation. The four-man dynamic produces twice the action, which can lead to twice the drama of a singles match, especially with the implementation of double-team finishing maneuvers. Tag-team wrestling is an art form that is beautiful when done right. Many teams have held the titles over the years, but where do they rank? Who are the best of the best? Today, I rank the ten greatest WWE Tag-Team Champions of all time. 10. Money Inc.: The Million Dollar Man and IRS were a match made in heaven. Individually, they were two of the best wrestlers on the planet. 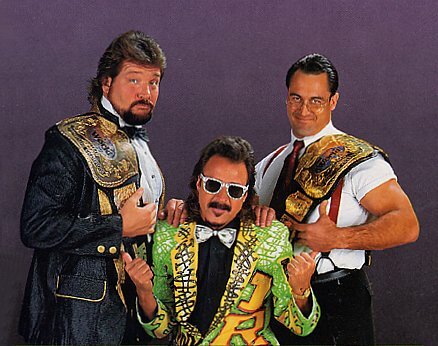 As a tag team, Ted DiBiase and Irwin R. Schyster were greedy money mongers who craved power, and this lead to three reigns as tag-team champions. 9. 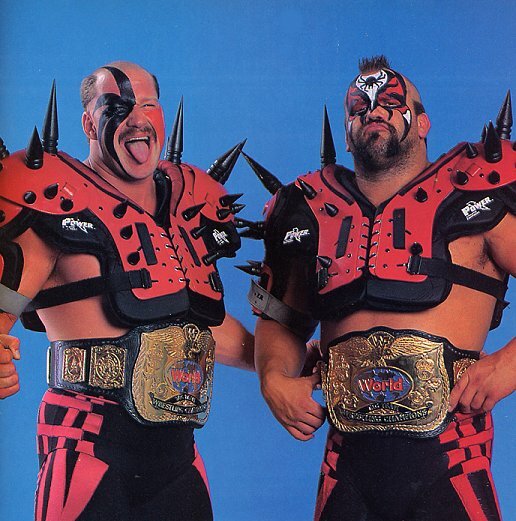 Legion of Doom: It was a big deal when the Road Warriors arrived in the WWF. Even if you didn’t watch the NWA on a regular basis, you knew the legend of these Mad-Max-looking monsters. Animal and Hawk defeated the Nasty Boys at Summer Slam 1991 to begin their first reign as Tag-Team Champions. Their second reign occurred in 1997 when they defeated The Godwins. You always knew what you were going to get when “OH WHAT A RUSH” came shouting out of arena speakers. They were intensity personified, which made them the most dominate and memorable team of all time. 8. New Age Outlaws: Road Dogg and Billy Gunn were the pre-eminent tag team of the attitude era. Their Dumpster match with Mick Foley and Terry Funk at WrestleMania 14 was a perfect blend of action and excitement. They were one of the most consistently entertaining acts of Monday Night Raw, and being a part of D-Generation X legitimatized their occupation as top performers in the company. 7. The Wild Samoans: Whenever someone talks to me about wrestling before I was born, The Wild Samoans are always mentioned. 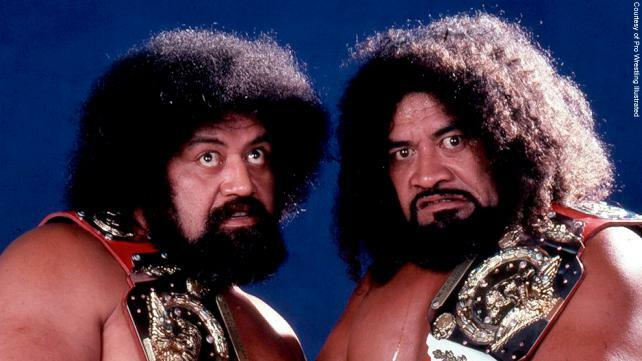 Afa and Sika, managed by Captain Lou Albano, created a path of carnage in a way that very few could. They were the first team to have three reigns with the titles from 1980 – 1983. Their grunting, raw fish eating, unorthodox escapades made them one of the company’s most intriguing acts and ultimately lead to their place in the WWE Hall of Fame. 6. The Hardy Boyz: Matt and Jeff Hardy are probably the only pair of tag-team champions to have a noticeable role as enhancement talent prior to making a name for themselves. Their ladder match with Edge and Christian at No Mercy ’99 put them on the map and made them perennial favorites during their TLC saga of matches. Team Xtreme was always front and center in the tag team ranks with 6 title reigns to their credit. There was never a dull moment with the Hardy’s as Swanton’s a plenty kept the fans wanting more. 5. 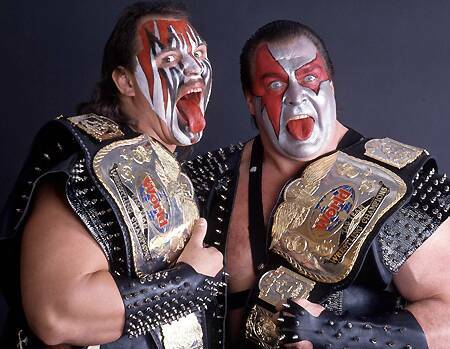 Demolition: Ax and Smash were the WWF’s prominent tag team in the late 80’s and early 90’s. The duo gets some slack for being Vince McMahon’s answer to the Road Warriors, but judging by audience reaction, no one cared. Demolition won the belts three times dethroning Strike Force, Brain Busters, and The Colossal Connection in the process. Their entrance music titled “Demolition” by Rick Derringer is recognized by any long-time wrestling fan. The team did add a third member, Crush, near the end of their run with the company, but Barry Darsow and Bill Eddie are the definitive duo that resonates with fans. 4. The Dudley Boys: The natives of Dudleyville quickly established themselves during the WWE’s attitude era. Their ECW roots served them well and lead them to 9 reigns as tag-team champions, the most in company history. Devon and Bubba Ray brought a new level of action and excitement to the ring as their table shenanigans always brought the crowd to their feet. While the duo has won every major tag team championship there is, they will be forever linked to those unforgettable TLC matches. 3. The British Bulldogs: The Dynamite Kid and Davey Boy Smith were a different breed of tag team. As imports from Stampede Wrestling, they wasted no time ingratiating themselves to the WWE audience with their high-intensity style. This led to the Bulldogs unseating The Dream Team to capture the WWE Tag Team titles at WrestleMania 2. After their feud with Nikolai Volkoff and The Iron Sheik, they would move on to The Hart Foundation where they would eventually lose the titles. As a team, The Bulldogs left an indelible impression that may never be duplicated. 2. 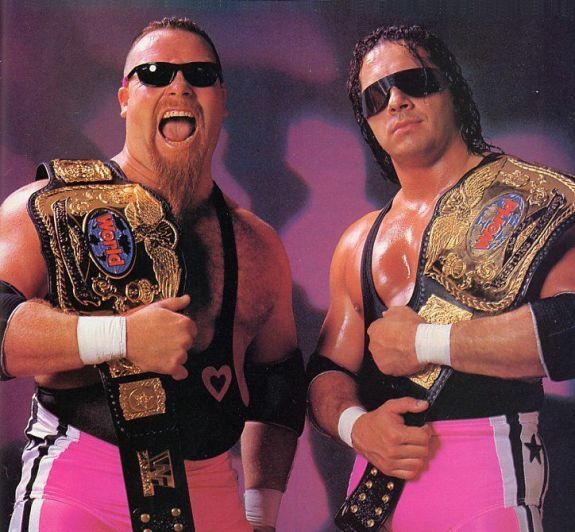 Hart Foundation: When I think of tag-team wrestling, the Hart Foundation is always the first team that comes to mind. Bret Hart brought speed and technique to the fold, while Jim Neidhart was the in-your-face power guy. This made it so that teams had to adjust during the match which was an interesting dynamic because most teams wrestled the same style. That is what made their matches with the British Bulldog so good because both teams wrestled a hybrid style. The Hart’s had two runs with the tag-team titles, outsmarting the Bulldogs as heels, and dethroning Demolition. They had great matches with every team, which is why they main-evented their share of house shows when names like Hogan, Savage and Warrior were absent. 1. Edge & Christian: If the Outlaws were the most popular team of the attitude era, Edge and Christian were the best. They could truly do it all on the microphone and in the ring. Their TLC matches with the Hardy Boyz and The Dudley Boyz defined an era of professional wrestling that may never be duplicated. Seven reigns as tag-team champions provided many jaw-dropping matches and laugh-out–loud moments. 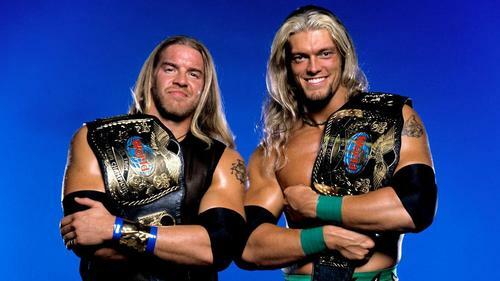 Like all good teams, Edge and Christian eventually broke up and they both became successful singles wrestlers which speaks to how good of a tag team they were because as both a tag team and singles wrestlers, they were able to grab the brass ring. Whether it was a Con-chair-to or a five second pose, Edge and Christian will always reek of awesomeness. ‹ Spoiler Alert: John Cena vs. Brock Lesnar at Summer Slam!?! ?